Imagine you are planning your grocery list. You know you have limited time to prepare meals and snacks each day. Many people struggle to make healthful food choices with today´s busy schedules. Cost and the amount of time you have to cook probably affect what you decide to eat. Think about nutrition, too. Food provides your body with the energy it needs to function and the nutrients it needs to perform well. What do you know already? 1. True or False: You can enter your daily diet and have its nutritional content analyzed. 2. True or False: Every person needs the same amount of calories, nutrients and physical activity to maintain health. 3. True or False: You will have the most bone mass when you are in your late teens to early 20s. 4. Which of the following vitamins helps your body absorb iron? 5. What is the daily recommended amount of iron for women in milligrams (mg)? 6. True or False: A diet high in fiber can lower your cholesterol and reduce your risk for certain diseases. Remember learning in elementary school about a food pyramid that was shaped, well, like a pyramid? The rules for following this pyramid were easy: Eat the most from foods on the bottom and eat the least from foods on the top. Everyone, regardless of gender, size or activity level, had the same pyramid. My Foodapedia: Enter the name of a food to learn how many calories it contains, and the food group in which it belongs. 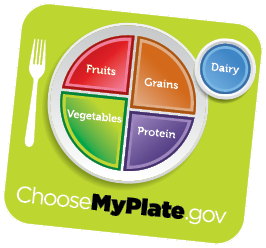 MyPlate Daily Food Plan: Find out how many calories and how many servings of each food group you should be eating each day. Food Planner: Plan a menu and find out how many calories and servings of each food group it contains. 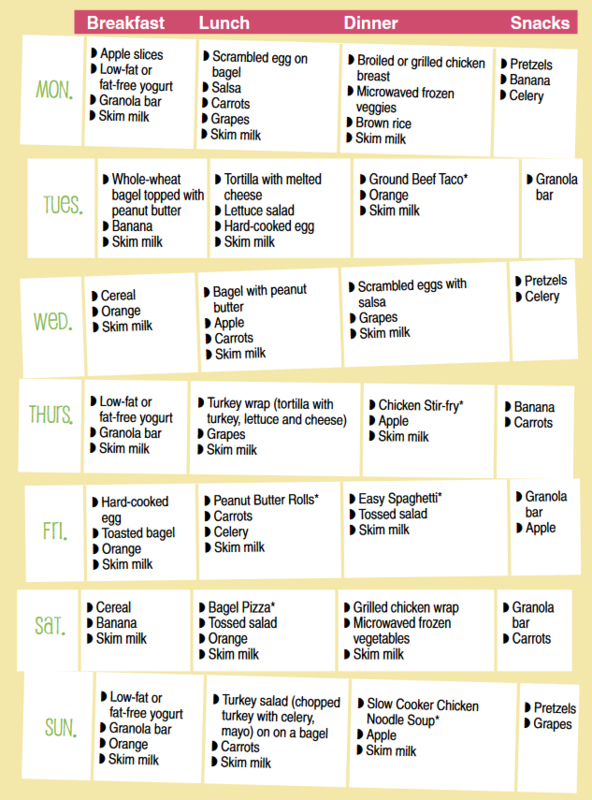 Food Tracker: Keep a daily log of your diet and exercise to view progress. Imagine you are planning your grocery list. You know you have limited time to prepare meals and snacks each day. Calcium: Calcium helps build strong bones, and peak bone mass is reached by age 30. Good calcium intake now can help lower the chances of developing osteoporosis, a bone disease that makes bones more likely to break. And not only is calcium good for bone health, it also can help the body by aiding in blood clotting and nerve and muscle function. Milk, cheese and yogurt are great sources of calcium. Males and females ages 19 to 30 should aim for 1,000 milligrams daily to reach the recommend amounts. Iron: Iron helps support growth and moves oxygen from the lungs to the rest of the body. Iron is found in lean meats and iron-fortified cereals, so start the day with an iron-fortified cereal and glass of orange juice or an orange. The vitamin C found in orange juice helps your body absorb the iron so it can be used. Try to have lean meats or dark leafy greens for lunch and dinner to reach the 18 milligrams of iron recommended for women and 8 milligrams for men. Fiber: Fiber is important for the digestive system. Some types of fiber also can help lower cholesterol and prevent disease. Fiber is found in fruits, vegetables and whole grains, so enjoy more whole-grain products and try swapping high-fat snack foods with apples, carrots or any other favorite fruits and vegetables. Women should try to get 25 grams of fiber daily and men should aim for 38 grams. Read through the recipes and check your supplies to see what and how much you need. To save money, compare unit prices (price per ounce) on the store shelving. Freeze leftovers in air-tight containers in meal-size amounts. Prepare the pasta as the package indicates. While noodles are cooking, brown the beef in a skillet and drain excess oil when done. Add the spaghetti sauce to beef and let simmer for 10 minutes. Top pasta with spaghetti sauce to serve. Top with cheese. Microwave on high, uncovered, one to 1½ minutes or until cheese is melted. Prepare the brown rice as the package indicates. Cut chicken into bite-sized pieces. While the rice is cooking, add cooking spray to the skillet and cook the chicken. When chicken is fully cooked, add the package of vegetables to the pan. Add sauce to the vegetables and chicken when vegetables are tender. Serve the chicken and vegetables over brown rice. Cut the chicken breast into small pieces. Place chicken into slow cooker with the carrots, onions and peas. Stir in the broth and mushroom soup. Season with pepper and salt. Cover the slow cooker and cook on high for three to four hours or on low for eight to nine hours. To maintain high-quality pasta, cook the pasta in a separate pan on the stove and stir in cooked pasta five minutes before the soup is ready to serve. Serve with whole-wheat crackers. Coat the middle of the tortilla with the peanut butter. Place the peeled banana on top of the tortilla. Fold the tortilla into a wrap shape and cut into small pieces resembling sushi rolls. Serve immediately. Coat the skillet with cooking spray. Thoroughly cook the ground beef in a skillet over medium-high heat. Add the taco seasoning packet to the beef according to the directions of package. In a warm taco shell, add beef, salsa, lettuce and cheese. Eat Smart. Play Hard. Together.